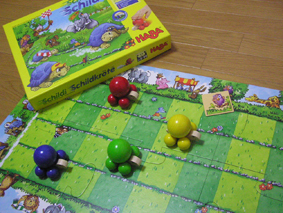 6th: Im Jahr des Drachen (Stefan Feld / alea, Ravensburger) 133pt. 7th: Keltis (Reiner Knizia / Kosmos) 130pt. 8th: I will go home first! (Philippe de Pallieres / Mobius Games) 129pt. 9th: Kakerlakensalat (Jacques Zeimet / Drei Magier) 99pt. 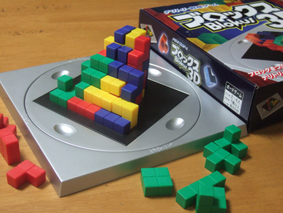 10th: Blokus 3D (Stefan Kögl / Beverly Enterprises) 93pt. 10th: Patrizier (Michael Schacht / Amigo) 93pt. From this year we combined former four branches and nominated no games. Voters selected upto five favorites from a list of 154 titles, which were sold in Japan from October 2007 to September 2008. We added up for each voter 5 points to the first favorit, 4 points to the second ... 1 point to the fifth. 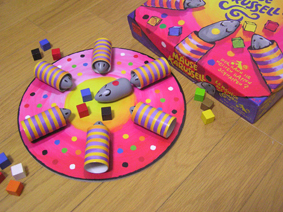 Total number of voters amounted to 317 from 32 Prefectures in cooperation with many boardgame circles and shops. As a result "Wie verhext!" 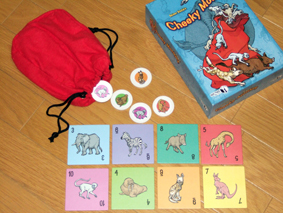 won the Japan Board Game Prize 2008. The 8th prize "I will go home first!" (Japanese title: Osaki-ni-shitsurei-shimasu) is a revised version of "Who is going to the dishes?" by Mobius Games. And the special prize "U-more Award". This award is selected by jury from our organization for the most contributing games to spread boardgame culture in Japan.